Technology has been with us since I’ve been a teacher. I started my career succumbing to the alluring aroma of the Gestetner (Ditto/Banda/spirit duplicator) machine and its purple stained sheet. Then the photocopier arrived and we didn’t think it could get any better than making copies of a page for every child. The reality is that many teachers still rely heavily on the immediacy and simplicity of the photocopied black line master provided by someone else. It is far less confusing that all that technical mum jumbo introduced with the computer in the 90s. The challenge then with the iPad is like anything else computer related. Can we get the teachers on board? Regardless of Apple’s PR machine telling us how magical and simple it is, despite the fact a toddler can pick one up and play games without batting their cute little eyelids, the fact remains there are still many teachers who haven’t embraced laptops after 15 years of exposure let alone a completely different system present in the iPad. Already inundated with training in new Maths and Literacy methods, weighed down by the pressures of Personalising learning and continuous assessment, asking the reluctant techno phobe to spend time learning the tricks of the wonder tablet can be a big ask. So how do we do it? For successful integration of iPads in classrooms to happen, you have to convince the classroom teacher that it’s worth the effort. In no particular order, these are my suggestions (with a little help from my blogging friends). Sometimes it’s easy for leaders to see or hear about something and want it to happen. They then pass it on to the next level with the specific expertise in the area to make it happen. Nothing wrong with that. That’s distributive leadership and in theory it works effectively. The problem arises when there are so many initiatives within a school there is a battle for ‘airtime’ to get your ‘baby’ in the spotlight at staff meetings, planning days, and so on. So, for me, it becomes really important that if the iPad is to become reality at the school, the leadership of the school have to live with it as well. Staff have to see the leaders of the school embrace the iPad at the school. The leaders have to initiate conversation about it. They have to be seen using it and talking about how they can see it being used in their area of expertise. Everyone expects the ICT leaders to do it. They’re experts – it’s easy for them. But if the previously reluctant literacy or numeracy co-ordinator presents a staff meeting using the iPad as a tool, if the principal shares a reflection made using an iPad, maybe, just maybe, the unsure members of the staff may have a go at trying out this new device. You can’t expect everyone to jump on board just because you’re excited. Everyone has their own stuff to do and won’t take the time to try something new just because you want them to. From my experience, compliance doesn’t work. Teachers go through the motions in public or give it a go for the required time, then go back to their preferred way of being when no one’s watching. Hey, I’ve done it, so let’s not kid ourselves. A far more practical way is to get the Willing involved. Get a small group of early adopters together, preferably one from each level if you can, and build their capacity for using the iPad. Give them the chance to discover new ways of teaching with it. Provide opportunities for them to share their ideas with their colleagues. 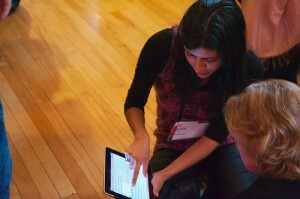 Some team teaching/collaboration could show the reluctant how the iPad can work with their students. Of course it won’t be all plain sailing. They’ll get distracted by the gimmicky. They’ll misunderstand what some apps can do. They’ll be unsure of all the possibilities. However, over time, with support, I think it will work. Obviously not the typical “everyone sit in front of an interactive whiteboard and watch how great this is” style of PD. The introduction of ICT tools need better than that. I’m talking about continuous, regular, “hands on” collaboration. One of my favorite bloggers, Henrietta Miller, introduced me to the idea of Techie Brekkies. The stark reality in schools is that staff meetings are almost fully booked before the year begins. In competition with Literacy, Numeracy, Inquiry, Administrative matters, and all the other stuff that just has to happen, ICT would be lucky to get a couple of meetings a year. So you have to be smart and creative. Techie Brekkies are a way of getting teachers together informally to learn, share, collaborate in small doses on a single topic voluntarily. (more detailed info here courtesy of Henrietta). We started late last year. We had some good ones. We had some bad ones. This year I hope to be more organized and offer a more structured program in collaboration with what teachers want. we have to get the timing right as well so more will commit. But I see it as vital. Finally, the real experts – the kids! Teachers want the best for their students. There’s no doubt about that. If, and to be honest it’s still a big if, the iPads could make a big difference to their learning, teachers will want them in their rooms. So what better way to get teachers on board than to get their class to convince them. Don’t let the teachers hang onto the iPads too long. Get them in the hands of those we are supposed to be buying them for. As I mentioned in my “no web 2.0 = iPad fail” post, web 2.0 tools exploded in Grade 6 last year because the kids were already using them at home and introduced them to classes through their presentations. Children find this whole technology thing a lot more natural than most of us adults. While we are muddling around trying to work out whether to pinch, swipe or double tap, they have probably already half finished their animation or movie on the iPad. left alone, children experiment instead of panic. They try instead of give up. So give the iPads to them. Either way it will work out. If they love them and embrace them, then teacher will want them in their room. On the other hand, if we discover they are not as excited about them as we thought they would be, then we will quickly find out we don’t need to blow $30000 on equipment we don’t need. As an aside, I hope to work with our school’s newly elected student ICT leadership team along with our ICT Leader to develop capacity in using ICT in all classrooms. If it gets off the ground ( and we haven’t had the discussion yet as a school so it may not), I can see this as an opportunity for these students to be a great support in testing iPad apps out and sharing with the school. We may even get them to start a blog like me to help out the school community. Just a thought but you have to dream. It’s all fantastic for school leaders and individuals alike to have great ideas. However, without the teachers being on board with the idea, it never works. So, if you’re planning on implementing some kind of iPad program in the future, consider these issues carefully. To be honest, I’ve only lived through a fraction of what I have discussed here. The majority of it is hope and theory. I’d love to hear from other schools who have actually gone “whole hog” with iPads or just started smaller programs as well. How did you do it? Am I making sense or well off the mark? Leave a comment and join the conversation. This entry was posted in iPad and tagged engagement, Henrietta Miller, iPad, laptops, leadership, learning experience, PD, pilot program, Techie Brekkie, tools, Web 2.0 by mgleeson. Bookmark the permalink. Just starting with ipads in our school this year -one for each of the junior teachers to try and get them interested and involved. This is a good post, a reminder of how to go about it. Hope the trial goes well. Would like to hear whether the junior teachers embrace them. I find small exploratory groups can be quite thoughtful regardless of prior expertise or experience if given the right tasks or questions. Thanks for those links. Quite a detailed plan for working through apps and iPad in general with teachers. Could be adapted to use with student leadership team too. Or parents. It could be chunked into 1 hour workshops over a month or two. Teachers (and students and parents) will probably be more thoughtful if it isn’t raced through. Never thought about parents. Good point. Relevant to me at the moment as my children’s school have gone 1:1 iPad this year. I’ve had to help 5 of our friends set up the iPads during the holidays because they didn’t have a clue. School has just assumed that everyone knows what to do. No instructions given at all. Our school is implementing iPads this year – we started out as you described in your post. A small group of teachers were given iPads and trained to use them, but this is where the problems began. There are several issues with saving student work on the iPad. We are not 1:1 so students have to share an iPad. If a student in 1st period completes an assignment, the student in 2nd period can open up the same iPad and copy the other students work. Our school also has a lot of restrictions on what the students can do on the Internet so that limits their work as well. Then our school veered off the path of implementation by handing out iPads to every teacher in the system – before providing them with ANY TRAINING! They have also not provided the teachers with VGA cords so they could hook up the iPads to the Smartboard and use them in the class. Our system is attempting to use this tool but they are rushing into it with no plan beyond purchasing them. The teachers feel the iPads are great but are of little value if not driven by the curriculum. Thanks for comment Alicia. Lack of organisation is a big concern for me. I’ve seen it many times over my 25 year career. Rooms of computers purchased left empty because teachers didn’t know how to use them. Too often with technology school buy stuff to just to have an image of being up with the latest. Quantity never beats quality. I have made a website and a documentary with my class in the past when we had 2 computers to access and yet you can have empty labs in other situations. There has to be a plan. And Teacher Training and acceptance is a must. Getting the willing involved is indeed the key. Success breeds success…their friends will ask them questions and so on. Learning will go viral! Getting the kids involved will help too. Very true about their wonderful experimentation skills. Of course lots of students aren’t computer whizzes but enough are that they can take the rest of the class and the hesitant teacher along for the ride if they are allowed. Just the sort of blog I need to get me thinking more clearly about implemented iPads into our Primary School in the UK – thanks. Getting teachers onboard, is indeed going to be a challenge! When laptops were the ‘in thing’ every member of staff got a laptop – I know for a fact that some teachers gave them to their son/daughter never to be used by that teacher(s) again. I know of a school that has just done the same with iPads, just like Alicia’s reply above – Is this method is going to have any impact on teaching and learning across a school? No, I can’t see it, the iPad just becomes a gimmick for the odd lesson and teachers have a nice looking calander and someone who at home can make better use of it. We’ve had 15 iPad 1s on loan for a couple of weeks now and they’ve been a great success in engaging and motivating our children. I agree with Ken Robinson that schools need to get more creative (see link below) and I think iPads and apps used correctly could have a profound effect on how children learn in the classroom, but it’s got be rolled out correctly, otherwise this amazing technology is a waste. I’ve had an iPad 2 for 8 months and cannot rate it highly enough – my 1 and 4 year olds love it and love learning on it (I’m not a pushy parent … honest), but what concerns me is that when my 4 year old starts school she’ll be sat infront of a desktop computer, waiting for it to load, a teacher or a teacher assistant will then log them on (*insert a child’s name here* can’t write, so how can I expect him/her to type his own name in! – this is an issue for another blog) type in the website for them (30 of them), then my daughter (hyperpothetically speaking) spends the last few seconds (slight exaggeration) of the lesson putting clothes on the teddy when the weather’s cold outside or when it sunny etc – I’ve seen lessons like this very recently. My point here, is that my 1 year old (nearly 2) can do this on the iPad in a matter of minutes, and this is not because she’s some child prodigy – she is just engaged with the technology and finds it a rewarding experience on an iPad – it works and it work fast! I’m 33 and in my lifetime a piece of technology has never captured my imagination the way an iPad has, but getting teachers (or some) onboard is going to be a struggle, no matter how inspired the children are with iPads or how passionate I am about them – as you mention in your blog, teacher will just pay lip service to it, then go back into their comfort zone. But as educators, surely we have a duty to engaged the children’s we teach in the most inspiring way, which allows them to be creative? This for me is the iPad! Wow, dmandrews, you could write your own blog with a comment like this. Thanks for the input. It is why teacher training is so important. 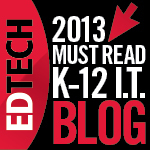 Just sticking tech in a classroom doesn’t translate into effective use. I like your comment about young children’s experiences with networks and logins. That kind of adult tech environment does make it a challenge for them and the iPad certainly makes it easier for them. Of course just as important is what they ar used for and that is something else that has to be considered as well. Hope you come back for future posts. Appreciate time and effort put into reply. Hi there. I managed to borrow one of two iPad sets for January. 5 iPads in there. The kids loved them, and many colleagues asked about where they can get some. Unfortunately, our Board only has two such kits for ~170 elementary schools and they’re all booked. Getting budgets on board the iPad Express may be more difficult than teachers. Thanks for the comment, Mr Nanu. Obviously affordability is a massive block to implementation. It’s also why it’s important teachers are on board. You don’t want to spend the money on expensive toys not being used effectively. When I read comments on using iPads in the classroom, I always wonder why no one asks the question “and how wil I manage these 50 ipads”. Also the lack of apps (situation in Belgium) with the possibility of self-correction and a sort of follow-up system, makes iPad less interesting to use in a classroom. In favor of the iPad (already mentioned above) is the way they motivate and engage students (and teachers), also due to the easy way they work. Luk, I agree the management issue is not an easy one and I am looking at discussing that in a future post. I haven’t found it easy and we have barely begun at our school. My daughter’s school has just gone 1:1 iPads and have handed over management responsibility to the student. Gave them a list of required apps, a $50 iTunes gift card and expect them to load and update in the own time. We’ll see how that pans out. I’ve been called upon by several families to help out already and school hasn’t even begun! Great post. We’ve been running 1:1 iPad programs now for 18 months and will see our iPad pool increase from 120 to 400 this year. I loved what you had to say i your post and was happy to hear another educator on the same page! From ALL of the dealings i have had with schools and colleges attempting to embed iPads in to their learning and teaching, it is Leadership that is the key. Having strong support is essential! Thanks for the comment, Corrie. I’ve been to your school’s site and read what your school is doing. Hoping for some advice on proxy and Dropbox! Glad to hear you think like me. Challenge is to make it happen! Our School has introduced one to one iPads for students in Years 7-10 and optional iPads or laptops for students in years 11-12. Staff have had a laptop provided for them to ‘play’ on for 12 ,on this prior to this introduction for all secondary students. The roll out has been relatively smooth. Staff are presenting in 5 min hits at staff meetings so that others can see the things that are being used in classrooms and how they fit into the pedagogy. Love the idea of 5 minute hits at each staff meeting. Puts the onus on all staff to come up with ideas and takes the pressure off the ICT gurus to do everything.